Do you have an older home or building in Westfield, Indiana? The exterior of your home or building won’t look beautiful for very long if it’s being poorly maintained. Your Paint can peel, crack and begin to fade if the surfaces below weren’t properly prepared. Metal roofing and siding surfaces can begin to oxidize and show signs of surface corrosion in just a few short years if left unprotected or with inferior surface coatings. When it comes to painting, power washing and concrete coatings it’s important to work with the professionals. White’s Painting and Power Washing is a full service painting and power washing contractor serving all of Westfield, Indiana. We have over 30 years experience cleaning and painting residential exteriors and a wide variety of exterior surfaces such as steel siding, aluminum siding, metal roofing, concrete, cedar, natural wood and more. More than just painters we are your corrosion and weather protection experts for all of your exterior surfaces. When it comes to residential work we specialize in interior repainting services and exterior painting projects of all sizes. We can repaint the exterior of your home, or out-building, seal your driveway or carport, Coat An Old Metal Roof or paint all of the trim around your windows and doors. We also very specialized services such as painting aluminum siding which many painting contractors do not offer, or if they do very seldom is it done correctly. Our specialized residential painting services will help you keep the exterior of your home looking great for many years. Agricultural operations are no stranger to wear and tear on their buildings from the elements. If you have steel buildings such as storage sheds, barns and morton buildings, large steel buildings, or steel sided buildings then we can offer you a very specialized service in power washing and painting these for you. We have intricate knowledge of the coatings we apply and many years of experience painting these type of buildings. We can offer you high quality workmanship and excellent durability that we’re happy to stand behind. Does the exterior of your Commercial building need a facelift? We can repaint and refinish many types of commercial building exteriors including stucco siding, cement brick walls, metal sided buildings, aluminum sided buildings, fiber cement siding and more. From single buildings to small strip malls and commercial new construction projects we can offer our exterior painting and coating expertise. Before any surfaces are painted they must first be cleaned and prepared. 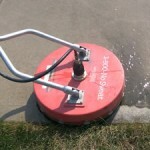 Power washing is one such method that is very popular for preparing exterior surfaces. From concrete to vinyl or aluminum siding and everything in between our expert power washing team can clean up your project in no time. 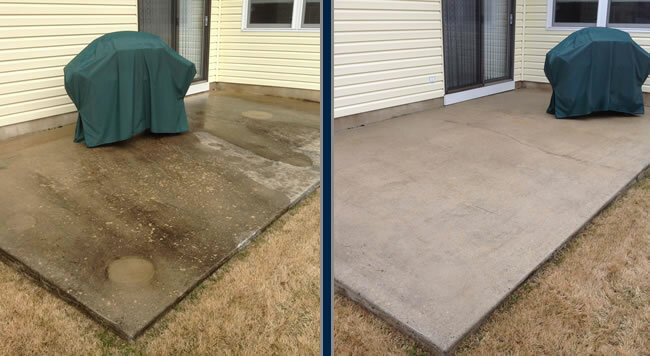 We power wash concrete porches and patios, driveways, houses, commercial buildings, algae removal and more. If your building exterior is dirty and the thought of having to wash it yourself seems daunting then you need to give us a call today and see how affordable our services can be! When you choose White’s Painting and Power Washing to complete your exterior painting and cleaning needs you are partnering with a company that has over 30 years experience in our trade. As an owner operated company you’ll have the owner supervision and attention to detail at every step of your project. If you want your exterior to look it’s best then give White’s a call today. I waited to post my review. Bob and his nephew came and painted my barn roof which was quite rusty. On cloudy days you could see a line where the paint overlapped. I called Bob and let him know that it wasn't exactly what I expected. He and his nephew came back out a couple of weeks later and put another coat on the roof, no charge. His nephew even painted some trim on the barn that has rusted, no extra charge. I am very pleased with the service and the quality of the work. I would happily recommend them for their painting. Very friendly people. "We hired Bob to do a roof & house washing for us after finding him on ServiceMagic. He definitely lived up to his high Rating!! The house and roof look beautiful, his communication with us was great, and he is just a really friendly guy. We would definitely recommend him to others, and will call him first for any other projects we need done." Whites Painting & Power Washing is a full service power washing and painting company serving Indianapolis Indiana and the surrounding area. Our power washing services including cleaning exterior surfaces such as house washing, siding washing, driveway cleaning, and more. We are also very accomplished professional painters and we specialize in interior painting, home exterior painting, metal building painting, agricultural building painting, and commercial painting. If you need to clean and restore any exterior surfaces on your home or building White Painting & Power Washing can help!